Public awareness that people with celiac disease cannot eat gluten is widespread these days. However, other people are avoiding bread, pasta and other gluten containing foods for health reasons. More than just the latest fad, research has shown a link between other autoimmune diseases -thyroid disease for example – and gluten consumption and subsequent digestive problems such as IBS. Japanese people consume a reasonable amount of bread and it is not unusual to find someone who eats toast for breakfast instead of the traditional rice and miso soup. Therefore, Japanese supermarkets have a variety of bread and pasta but none of the aisles of gluten free goods you may be familiar with at home. 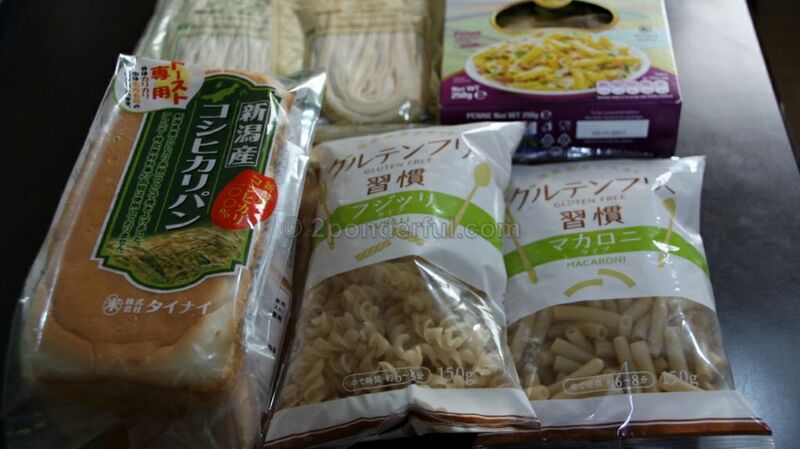 However, two of the supermarkets that stock foreign food have a small range of gluten free bread and pasta – Seijo Ishi 成城石井 and Kaldi Coffee Farm. Of these, Seijo Ishi – which has 110 stores throughout Japan – has the better range. Seijo-Ishi stocks four different types of gluten free bread. I buy the コシヒカリパン (Koshihikari pan) for the simple reason that, at 380 yen, it is the cheapest. The others cost in excess of 600 yen which I consider outrageously expensive! How does it taste? Well, let’s be honest, gluten free bread is never as good as the real thing and Japanese gluten free bread is no exception. It takes longer to toast than regular bread and is quite crunchy but it is actually pretty good.For those craving Italian food, the supermarket has several different types of pasta: spaghetti, fuselli, macaroni and fettucini. These are very reasonably priced for specialist food at around 200-300 yen. Again, the taste is OK. Perhaps not a patch on the pasta you used to be able to enjoy but quite enjoyable.